Effective management on resources – cost, time, space, and human resources – is the key for businesses to remain competitive and stand out. By means of virtualization technology, IT administrators can enjoy faster deployment on new servers, increase work efficiency, and reduce overall capital expenses through server consolidation. In addition to providing network attached storage service for file sharing, QNAP Turbo NAS is also an affordable iSCSI/IP-SAN storage solution that can be utilized as a network shared storage of the virtualization environments of small businesses. It helps achieve efficient cost-saving, energy-saving and utilization of storage capacity. Being virtualization ready - VMware Ready™, Citrix Ready™, and Microsoft Hyper-V™ compatible, the Turbo NAS leverages the benefits from virtualization solutions to help IT administrators flexibly deploy and manage the virtualization environment and effectively improve work continuity. The Turbo NAS offers flexible management through creating and allocating iSCSI LUNs (Logical Unit Numbers), mapping and un-mapping LUNs to and from the iSCSI targets, and thin provisioning function. As an iSCSI/IP-SAN storage solution, the Turbo NAS is capable of sharing storage capacity for multiple iSCSI targets and iSCSI LUNs over the network. It enables businesses to optimize the usage of storage capacity with disparate users within the organizations, preventing numerous storages dedicated to each user but left unused most of the time and further lowering the total cost of ownership (TCO). The Turbo NAS supports multiple LUNs mapping per iSCSI target. The LUNs can be flexibly mapped to, unmapped from, and switched among different iSCSI targets. Security can never be overemphasized in the networked environment. The Turbo NAS supports CHAP authentication and advanced Access Control List (ACL) to enhance the security of data transmission over the network. Besides, secure deployment can be achieved via the LUN access control. 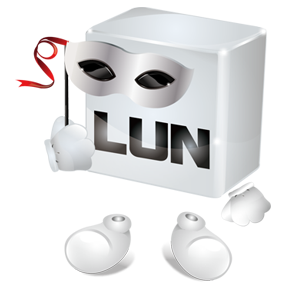 With the function of LUN masking, IT administrators can specify the access rights of the initiators to each LUN and prevent the risks from unauthorized access. 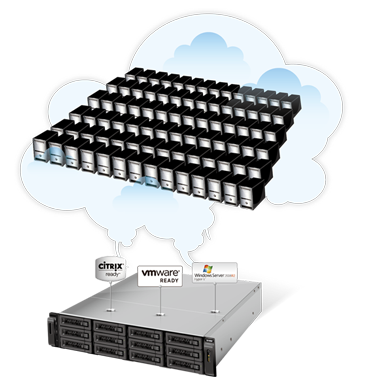 The SPC-3 support for clustered environment deployment enables IT administrators to quickly execute live migration for virtual machines. The MPIO (Multipath Input Output) and MC/S (Multiple Connections per Session) support allows IT administrators to connect to the iSCSI targets on the Turbo NAS using two or more network interfaces from the server with failover and load balancing and achieve enhanced data transmission performance. The Turbo NAS is certified with VMware vSphere NFS and iSCSI protocols, Citrix XenServer, and is compatible with Microsoft Hyper-V environment, making the Turbo NAS to be easily deployed as a shared storage in a virtualized testing environment where users need to run different types of operating systems and software applications. 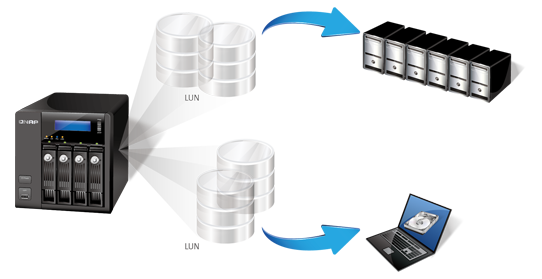 The Turbo NAS plays an important role in providing the backup solution. It can be utilized for backing up data from physical computers and virtual machines to achieve data protection and disaster recovery. The Turbo NAS has taken iSCSI LUN backup/restore to a whole new level with snapshot technology. Directly backing up an iSCSI LUN usually takes a long time. In addition, during backup a LUN usually continues to provide data access; this could cause backed up contents to be inconsistent with the original copy. The Turbo NAS provides LUN snapshot to overcome this. A snapshot uses little time to record the current LUN status, just like taking a picture. 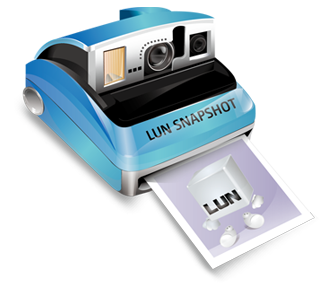 IT administrator can further use the LUN snapshot to back up, restore, or allow access to the contents in the LUN, while it is still being used.